Nylon - Most of our Canadian made flags are printed on premium heavyweight (HW) nylon as this material offers the best combination of presentation, performance and value. All our premium Nylon/210d Nylon flags are made in North America with majority of them being made in Canada. High tenacity 210 denier nylon offers superior performance and has rip-stop capability, prolonging lifespan of the flag and allowing for repair. Our custom flags are also made in Canada on heavyweight nylon. Polyester - Polyknit / Duraknit / Durapoly - Knitted polyester has a loose weave which withstands heavy winds. Our premium polyester flags are made in Canada. Polyester has the advantage of being cheaper than nylon however nylon is easier to repair. Econo-Polyester - Popular material for flags to be displayed indoors and for short term outdoor use at a very affordable price. Econo-polyester flags are made in China and Taiwan and are usually finished with 2 grommets. Rope and Toggle - Toggle is at the top of the flag, with a rope running through the sleeve (which is sewn closed) and rope comes out of the bottom of the flag. This allows the flag to be attached to a clip, ring or loop at the top of your flagpole halyard (rope), and the rope at the bottom of the flag can be tied to a clip or counter weight. The best finish for windy locations. Grommets - A grommet (eyelet) is placed at the top and bottom of the flag sleeve/header tape. 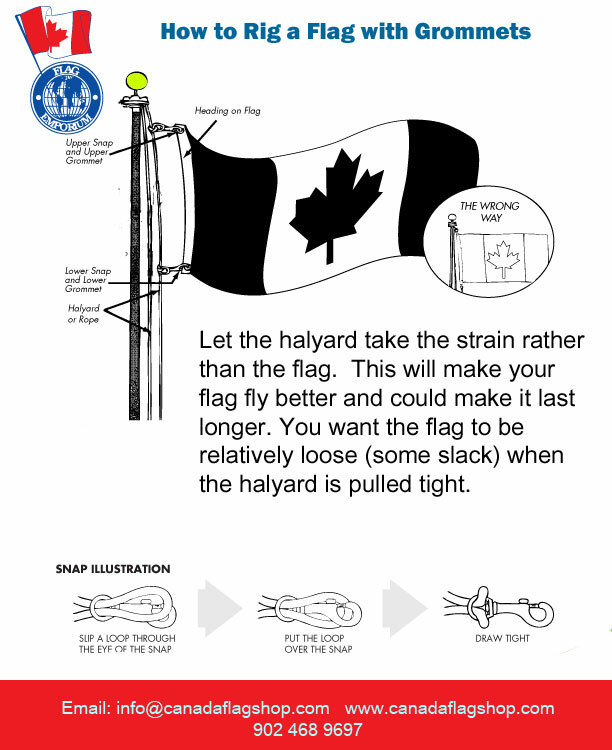 Allows the flag to be clipped or tied to a flag halyard or attached to an unfurler tube with zip/cable ties. NOTE: If the flag you would like to purchase is only available with a rope and toggle and you would like grommets, let us know when you order (fill in the Other Info field) and we will install them for you at no extra charge. Inglefield Clips - The Inglefield clip is used mainly by the military for joining a flag or ensign quickly, easily and securely to flag halyards so that the flag can be hoisted. Each clip resembles a link of chain, with a split through one side. The edges of this split are chamfered, so that the clips can be engaged or disengaged, but only if they are carefully aligned by hand. When pulled tight, the links are securely fastened. Clips are made of bronze alloy and contain a swivel which incorporates a rotational connector so that the halyard can partially rotate without affecting the flag. Naval flags or ensigns normally have both parts of a clip, one at each end of the heading. 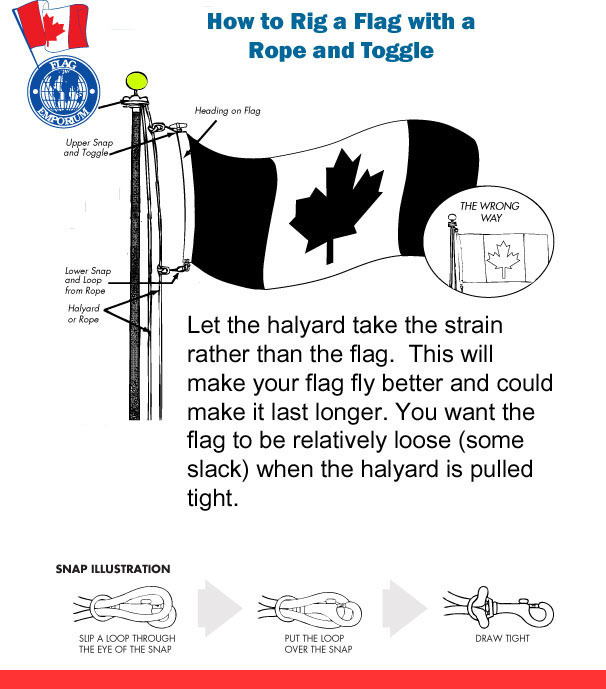 For proper mounting, one pair of Inglefield Clips should be attached to a halyard (rope) with another pair (corresponding pieces) being attached/sewn in to the flag itself. We stock Canada, Nova Scotia and most military flags finished with a set of Inglefield Clips. To be used properly you will need another set of Inglefield Clips on your flagpole halyard (rope). ARE YOUR FLAGS MADE IN CANADA? All our custom flags are made in Canada as well as our stock nylon flags, except for the 2'x3' size which are mostly made in the USA. Our econo-polyester flags are made in Asia. Our premium stick flags are made in both Canada and the USA, econo stick flags are made in China. WHAT SIZE FLAG SHOULD I BUY FOR MY POLE? 4ft Outrigger Pole - 18"x36"
6ft Outrigger Pole - 27"x54"
Check manufacturers specifications for recommended flags sizes as tolerances vary between different makes of pole and location of pole should also be considered. As a general rule taking the height of the flagpole and dividing by 4 will give you the perfect width of flag for it. Forever if you are putting it in a shadow box but the lifespan of a flag flown outside is affected by location, weather factors and airborne contamination. Your hard working flag shakes, trembles, drapes, snaps, chafes, bakes, freezes, ripples, flutters, furls, unfurls, twists, flaps, strains and flies! Regardless of how well a flag is constructed, a flag is , after all, a piece of cloth and will sooner or later succumb to the elements. 6) Ensure your flag has adequate room to fly without making contact with other objects eg. tree branches. WHAT TYPE OF ARTWORK FILE DO I NEED TO HAVE A CUSTOM FLAG OR BANNER MADE? For best results we require .ai or .eps files in vector (scalable) format. For accurate colour reproduction on regular flags we require Pantone (PMS) numbers for each colour being used. For feather flags CMYK colours are acceptable. If a vector file is not available then a high resolution JPEG or TIFF file may sometimes be used. Providing it's not too complex, we can redraw artwork in a printable file format for a fee. Price varies according to complexity of the graphics. WHY I AM NOT ABLE TO CHECKOUT ON YOUR SITE? Our Canada Post and/or UPS shipping modules are not able to calculate a shipping estimate for the items in your shopping cart. This can occur when you have a large volume of items, have your address details entered incorrectly or there is a temporary server outage. To complete your order please call us on 1800 591 8939 or copy and paste the items in your shopping cart into our email form, press send and we'll call you for your credit card information. HOW LONG DOES IT TAKE TO HAVE A CUSTOM FLAG OR BANNER MADE? Average time is 2-3 weeks depending on the time of year. We accept Visa and Mastercard credit cards only online. When submitted, your credit card information is encrypted on secure servers. We do not charge your card until your order is ready for shipping. Credit card information is erased once orders have been processed. IF I ORDER FLAGS ONLINE HOW LONG BEFORE I RECEIVE MY ORDER? We ship all in stock items within 1 business day of receiving your order. You can choose your shipping speed with Canada Post or you can choose UPS delivery where available. Standard shipping is via Canada Post Expedited shipping with typical delivery to BC 7-8 business days, Alberta 5-6 business days, Ontario 3-5 business days, Quebec 2-3 business days and the Atlantic provinces 1-2 business days. You can select faster delivery times via Canada Post Xpresspost and Priority service. WHAT IS CANADIAN FLAG PROTOCOL? © 2019 Flag Emporium. All Rights Reserved.